Once you have created your costume (apparel) vendors and sizes, you are ready to add costumes. New costumes are added from the Class record > Costumes (Apparel) tab using the Add Costume button. Go to a class and go to the Costumes tab. Click the Add Costume button. In the Add Costume window, enter costume details. 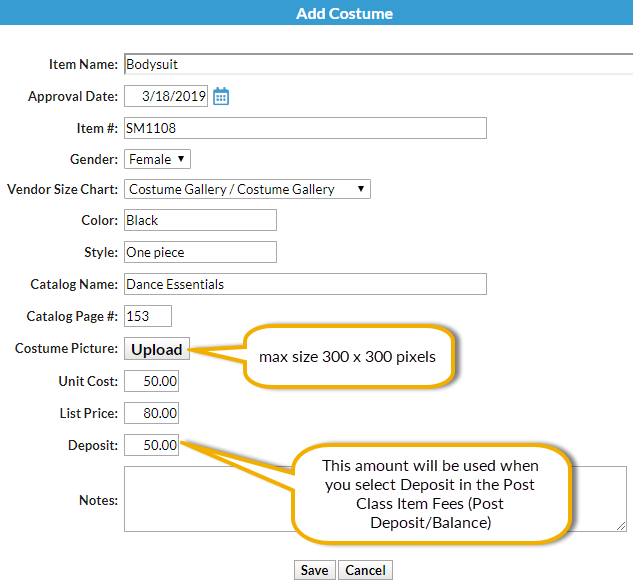 If your organization plans to post costume fees using Tools > Costume Management, Unit Cost, List Price, and Deposit Amount should be entered. Unit Cost = Amount costume costs your organization. List Price = Amount your organization charges the customer. Deposit = Amount your organization charges for a costume deposit. If you entered a Vendor Size Chart, and your database is set to not Hide Auto-Size (Tools > Edit Settings), enter Yes or No in the Auto-Size window to auto-size the costume. Note: If your database is set to Hide Auto-Size = Yes no Auto-Size window will display and no costumes will be auto sized. Click OK in Class Item Added window. Each Student has a girth size and a size. If auto-sizing has been used, review sizing. If you need to make a change, click the Size drop down list arrow and select a different size. Be sure to Save Changes. If auto-sizing has not been used, manually enter sizes by selecting them from the Size drop down list. Save Changes. Student's Gender versus Costume Gender and click the Do Not Order box if gender doesn't match. Any student marked "(Not Enrolled)" has the Do Not Order box correctly set. The costume assignments/orders are NOT automatically updated when changes are made to a class’s enrollment. Once costumes are assigned to a class, enrolling or dropping a student from a class requires two steps: Make the enrollment change, then click the Costume Sizes button in the Costumes tab to review and update the costume assignment for the new or dropped student. For new students, the costume sizes must be assigned. The Costume Size Entry page uses the color coding: Yellow=Not Sized, Red=Marked Do Not Order. Future Drop Dates are listed when applicable, so you can decide if you want to mark the student as Do Not Order. Use the Show/Hide Columns button to display only the information important to you.